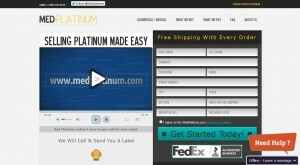 MedPlatinum address, phone, website, hours of operation, and more. MedPlatinum is a company that services the medical, dental, science, industrial and private sector. We are a joint effort of former EP lab techs and precious metal refiners who have set out to bring fast and trustworthy service to an industry that has been lacking in customer service and honesty. We wish to provide an outlet for precious metal waste to recycle and keep industries from having to mine for these metals and destroying local habitat. This is key in our drive to service our clients and do so with a positive purpose that drives our company.